We had a bitter orange tree on our balcony when I was a little girl, but I don’t remember the fruit. I don’t know if it never had any, or if it just wasn’t any good. I do remember using the leaves, in place of lemon leaves, as a topping to a raspberry chocolate ganache torte (the first REAL desert I can remember making) and in a curry-ish recipe, that must have called for lime leaves. I ate oranges by the pound, though. Blood oranges, tangerines, navel oranges from Sicily. I have a vague memory of lemon fruit pate, and my mother’s key lime pie, but mostly I eschewed other citruses (is that even a word?!) in favor of oranges. About 10 years ago I read Oranges It cemented my love for John McPhee, I think he is one of the greatest prose stylists of the 20th century. Oddly, though, the book turned me from Oranges. Oranges doesn’t just explore Oranges. 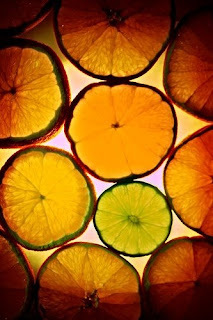 There are discussions of and digressions into all sorts of citrus. Bitter oranges, mandarins, limes, sweet lemons, yuzus, grapefruits, pomelos, lavender gems, and, of course, Meyer Lemons. I think reading Oranges coincided with moving to California, which would then of course coincided with the beginning of my love affair with Zuni. One night there I had a grilled fish with savory Meyer lemon curd on the side. One week I had a Meyer lemon custard. Once I had an ersatz pavlova, which of course included Meyer lemon curd. Then I branched out. A drive through Point Reyes yielded Meyer lemon olive oil, I preserved Meyer lemons in salt, from an exceptionally sweet batch I squeezed some juice for breakfast, I’ve grilled them with lamb sausages. So yes, this is my confession: like every other San Franciscan, every other blogger who’s ever written about food, I worship them. I wait every fall for the first to appear in the supermarket, for my coworkers to bring them in, for the overflow of the CSA box. I needed to whip up a quick treat last night and realized (yes, for the first time) that lemon bars are really just shortbread with lemon curd on top. Only better, apparently, like lemon curd died and went to heaven. “Key ingredient in lemon (heaven) bars” is moving to the top of the list of reasons why I am happy to skin my knuckles for a few hours a few Saturdays a year, when it’s Meyer lemon season. Zest ½ the lemons— the ratio is ½ tablespoon of zest for a 1/2 c of juice, which comes from about 1 lb of lemons. Squeeze the lemons, to result in about ½ cup of juice for every pound of lemons. In a pan over a very low heat, whisk together zest, juice, sugar, egg yolks. Raise heat to medium/medium-low. Add the butter slowly. Keep whisking until it is thickened and smooth (on a thermometer, about 160°F. Let this cool and then put it in a jar, and seal it. Some recipes suggest pushing through a sieve, or adding egg whites. The egg whites make the whole thing take longer to cook, and the sieve is only useful if the mixture isn't cooked evenly. Pre-heat oven to 350°F and butter a 13x9 pan. Slice the butter into tablespoon pieces then in a food processor, cream it together with the sugar. Add a pinch of sea salt, blend. Add the flour a ½ c or so at time. Try to use as little flour as possible, just enough to make a pebble-y dough. Use fingers to press the dough into the bottom of the pan, evenly. It’s far too short to roll out-- think cookie-crumbly-shortbready-thick, not lace cookies or a pie crust. Bake for 15-18 minutes, until lightly golden on top. Turn oven down to 325, remove pan. Spread 1-2 cups of curd across the top (using 1 lb of lemons should be just enough). Return pan to oven for another 18 minutes. Remove pan from oven and cover in powdered sugar, as quickly as possible (doing this while the bars are hot, so the sugar melts). Wait 10 minutes for it to cool.